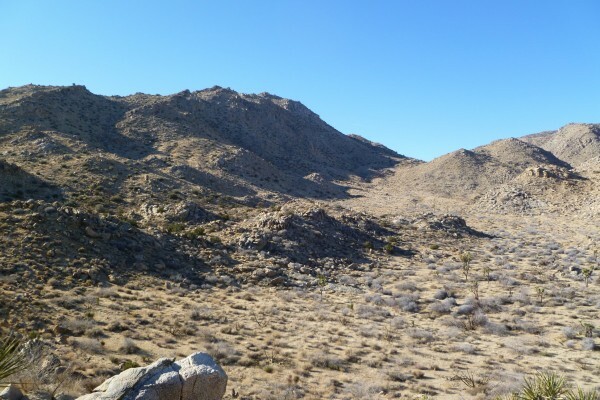 General search area: The southerly slopes of the mouth of Smith Water Canyon and the adjacent southerly canyon rim. Explained in way too much detail here: Current Bill Ewasko thoughts, January 2013. Ascending into the area westerly out of Quail Wash was generally pretty reasonable. The descent back down into Smith Water Canyon was a bit more treacherous. 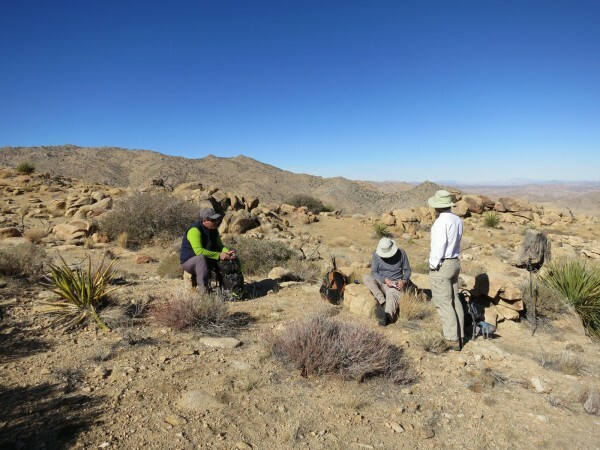 The upper areas contained significant rock breakdown making descent difficult. I’d describe the upper Smith Water area as “globally treacherous but locally manageable” in that there was almost always a safe route down if one looked carefully, but from a distance it appeared as an “Oh crap!” environment. 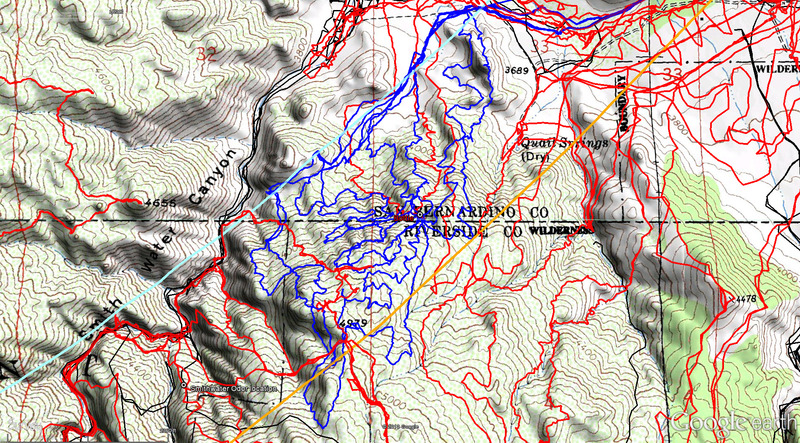 There are far more ravines, chutes and other hiding places than either topo maps or Google Earth suggest. In one word….mediocre. The rocky terrain really made it hard to see any large areas. In many ways it was reminiscent of the upper part of Johnnie Lang Canyon which is a jumble of rocks. Our planned search area covered approximately 200 acres however my sense upon completing the area is that we may have covered 50% of it at best. But we did cover a number of obvious routes. 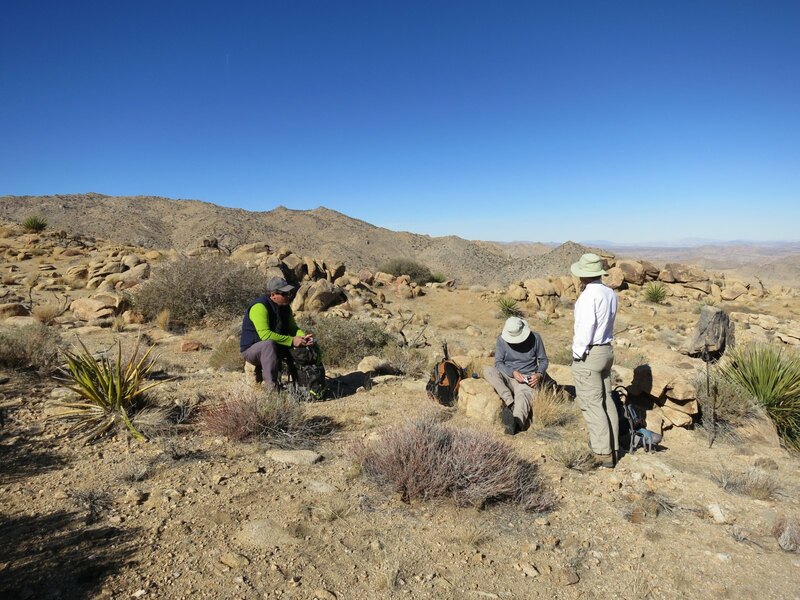 After a fairly pleasant ascent out of the Quail Wash area, the four of us met up where I had found the plastic bottle six weeks earlier on JT42. The consensus seemed to be that it might have been a Gatorade or similar bottle, probably not related to Bill. When checking the Verizon cell coverage at that point, we saw a solid signal, about 2 bars. The cell coverage map shows it as a very fringe area, so our measurement implies the cell splash map could be a little conservative, with the actual coverage area being a bit larger. We generally held to within the 11.1 mile radius of the Serin Drive cell tower under the assumption that was the maximum plausible limit for a record of 10.6 miles. However in the upper areas we did poke a bit beyond as the area looked worth checking out. In addition to the usual assortment of lost and dead mylar balloons, we each came upon separate Big Horn Sheep skeletons. Every few trips to the more remote areas we might come upon one, but never four in a single trip. There must be something about this area. I updated the panorama I took on JT44 of the southerly slopes of Smith Water Canyon with the tracks we made this time. As before, the JT45 search tracks were added with a draw program by hand while comparing the image against a perspective view in Google Earth showing the tracks. They are not 100% accurate but reasonably close and gives a good idea of the areas covered, at least on the canyon slopes. The tracks for this trip, JT45 are shown in dark blue. Tracks made by the original searchers are in black and those made since are in red. The light blue line is the 10.6 mile radius to the Serin Drive cell tower and the orange line is the 11.1 mile radius. A view of the southerly slopes of Smith Water Canyon showing our approximate JT45 tracks in darker blue. The red lines are our previous tracks, the black lines those of the original searchers, the yellow line the 11.1 Serin cell tower radius and the light blue line the 10.6 mile Serin radius. I’m running out of colors. This was taken on the ascent, generally looking west. 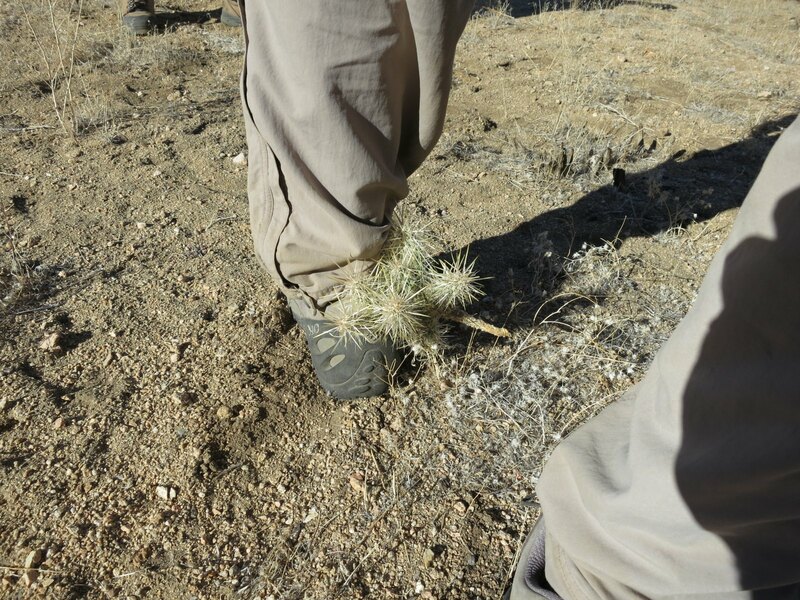 We have already split up and are all headed for the area in the upper left where the Bottle Bush is. The highest rocky knob is where the Serin tower cell coverage is. Our descent routes we in the central shady area and just beyond the far ridgeline to the saddle. This was the Big Horn Sheep I came upon. 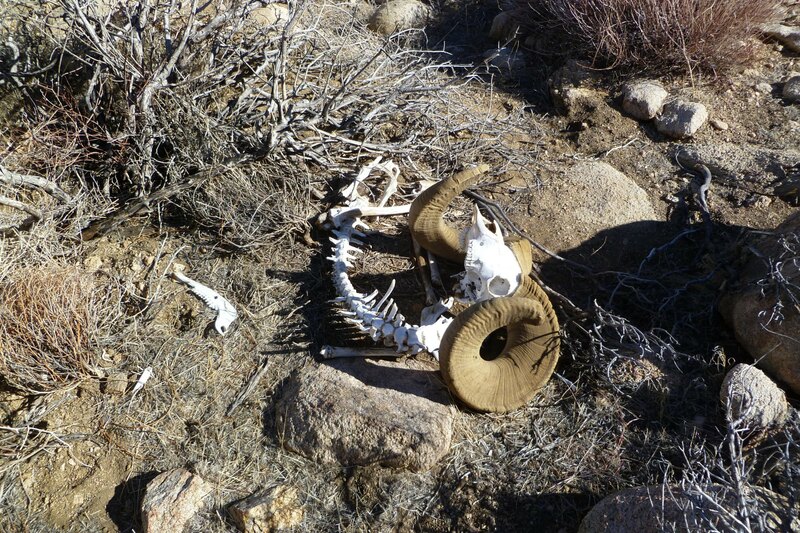 Each of us, while searching separately, came upon different skeletal remains of Big Horn Sheep. Is this not a healthy place for Big Horns?